satisfaction with waiting rather than the actual waiting time itself. 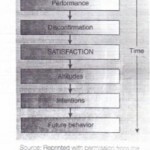 Maister" presented an iitial framework for focusing on customer satisfaction with waiting, identifying many of the factors that can affect satisfaction. To further assist the service manager. these factors can be classified into three categories: (a) firm-related factors, (b) customer-related factors, and (c) both firm- and customer-related factors. Service managers, in order to effectively manage the customer's waiting time, must distinguish between those factors over which they have total or at least partial control from those over which they have no control at all. Factors that fall primarily within the firm's control can be grouped into four types of waits: unfair versus fair waits, uncomfortable versus comfortable waits, unexplained versus explained waits, and initial versus subsequent waits. Unfair versus Fair Waits The successful management of the customer's perception of fairness with respect to waiting is dependent on queue design. service system design, and contact hours. A popular approach, to ensure fairness, is to group all customers in o a single queue or line. When more than one server is available, the first person in line moves to the next server that is free. This method has been adopted by many bank and airline check-in counters. Not only is the combined queue perceived as fairer, but the average wait also has been shown toe considerably shorter, even though the line itself is longer. However. managers also need to take into consideration the physical elements of the operating system. For example, the physical space required by customers and their shopping carts has precluded most supermarkets from adopting the combined queue approach. More subtle elements of service system design, beyond the physical waiting. also can affect customer perceptions of fairness. Interruptions by telephone calls during busy periods.